Hi Everyone!!! I just wanted to tell you I've had a wonderful day. I can't believe the weather we have here; this time of year is generally cooler. Today though it's really warm ~ summer weather like. I enjoy it though because I know that colder weather is coming too. Anyway, with Halloween coming and Harvest Time coming I thought I'd start making some fun stuff. We celebrate Harvest. I really enjoy the fall season, the changing of the leaves, the colors of Autumn. 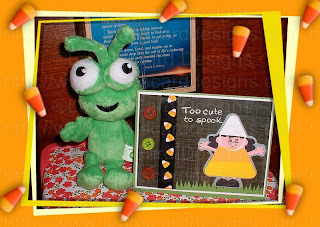 This cute little card I added the sentiment, "Too cute to spook" from My Pink Stampers stamp set, but I wrote it instead of stamping as I do not have her Halloween stamp set. I just loved the sentiment and thought it was perfect for this card. I used the green to cut the grass 3.5 x 0.5 to put under the feet of our cute little candy corn. Then I cut the black at 3" to make the base of our candy corn. 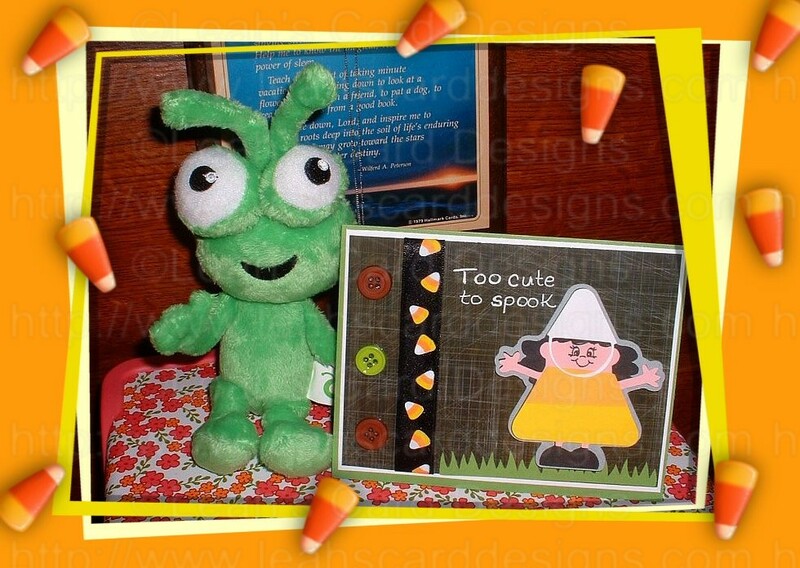 I then used the pink cardstock to make for the face, hands and legs of the candy corn which was cut at 1.8". Then I used the orange cardstock for the top of the candy corn which I cut at 0.6", then I cut the yellow cardstock at 1.25" for the bottom of the candy corn. The gray cardstock was cut at 3.1" then the little white hat part of our candy corn was cut at 1.45".